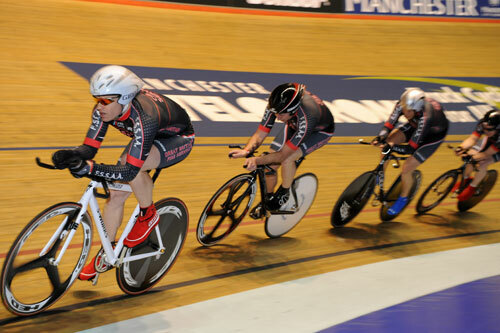 Geraint Thomas, Ed Clancy, Chris Newton and Rob Hayles were at the Revolution track meeting in Manchester Velodrome on Saturday night, fighting it out for points in the popular track series’ new team championship format. The 2009/10 season championship is now reaching its conclusion, and there was all to play for with some of the key players in the Revolution squads absent. 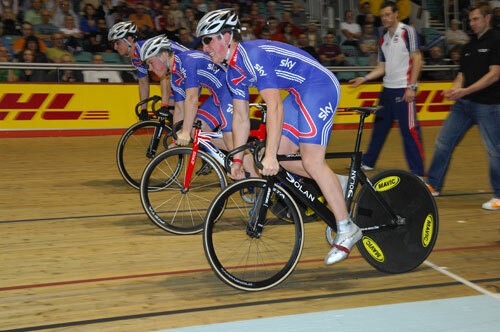 The Motor Paced Scratch Race was fast and furious and featured Revolution regular Rob Hayles and Team Sky recruit Geraint Thomas. 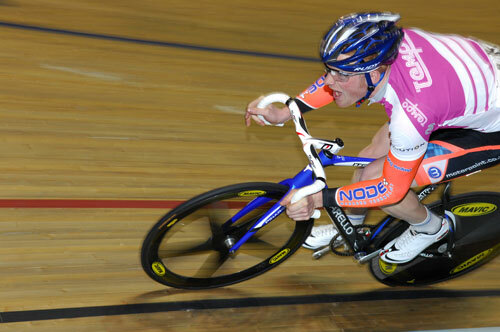 But it was Ed Clancy (Tempo) who took the spoils, just holding off Thomas who was fresh back from the Team Sky camp. If there was one person in the Revolution line up who you’d put money on to win the points race, it would be the master of the race, Chris Newton (Rollers). He overpowered Andy Tennant and Luke Rowe to prove he’s a tough one to beat in his specialist subject. The two British male sprinters who made it through to the championship sprint semi-final struggled against overseas competition. Callum Skinner (Tempo) lost out to Stefan Boetticher (Vitesse), while Louis Oliva (Slicks) pipped promising youngster John Paul (Forza). Boetticher beat Oliva in the final, in 11.355. In the female championship, Christina Konsukle (Dynamo) and Charlott Arndt went head to head in the first of the semi finals. Helen Scott (Slicks) faced Krystie Cyprien (Dynamo). Konsukle and Scott went through, with Konsukle then demonstrating she was too powerful for Brit Helen Scott. The Madison Time Trial is always a popular inclusion in the Revolution programme, Ed Clancy and Andy Tennant, who now both ride domestically for the newly launched Motorpoint-Marshalls Pasta team, showed that Tempo were the fastest on this occasion with 56.235; it was quite a way ahead of the next challengers, with Slicks’ Luke Rowe and Sam Harrison in 58.405. 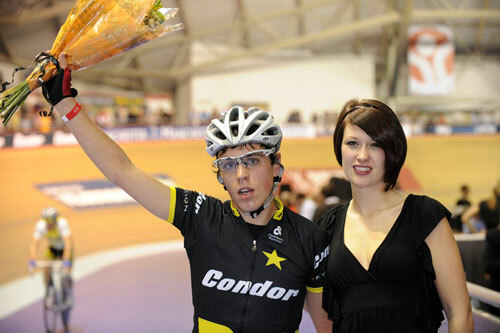 Stefan Boetticher was the dominant force in the Revolution sprint events; the German also beat his sprint rivals in the six-lap Male Keirin, with Revolution 27 turning out to be quite a successful night for him. Meanwhile, in the women’s Keirin event, Helen Scott quickly forgot about her disappointment in the match sprinting event, as she took a good win in the Keirin, over Linda Michelini (Rollers) and Charlott Arndt (Vitesse). Tim Kennaugh (Rollers), who is a new addition to the Great Britain Academy will be pleased with his win over Simon Yates and the experienced Geraint Thomas. Tim will be wanting to emulate his older brother Peter’s success in turning professional with Team Sky, and judging by his performance today, he’s well on his way and is already a strong choice among the Great Britain squad. 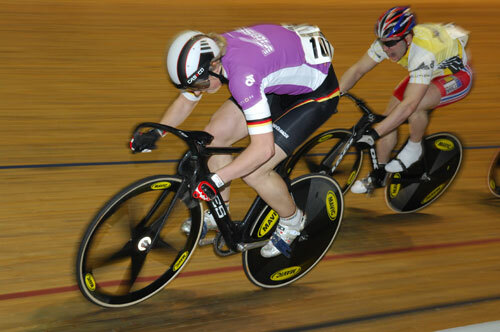 Harriet Owen (Forza) proved her consistency and continued on from her impressive performances in previous Revolutions; she took the win in the elimination race. Another regular Future Stars victor, Emily Kay (Dynamo), added another one to her tally in the Six Lap Dash. She also went way ahead of her rivals in the Points Race scoring 15 points, proving considerably stronger than Owen who finished with six points. Away from the championship, there were two more events set to excite the packed audience of Revolution 27. In the Invitation Team Sprint, a combination of French and German riders beat the Great Britain trio of John Paul, Kian Emadi and Louis Oliva in 47.275. The young Great Britain riders lagged behind slightly in 48.184. It wasn’t a great time for the Great Britain women either. The Germans went one up with the duo of Arndt and Konsukle going ahead in 36.823, ahead of Joiner and Scott in 37.445. France came in third with Cyprien and Michelini just behind in 37.385. With only one more event to go in Revolution Season 7, the standings haven’t changed much at the top; Slicks remain in the lead and now have 28 points, ahead of Forza (23) and Dynamo (21). Revolution 28 on February 27th will be the last opportunity Forza and Dynamo have to try and overturn the dominant Slicks. Kicking off the evening was a face-off between two of the emergency services. Riders from the Fire Brigade and Police Force battled it out in a team pursuit format, raising money for three worthy charities, with the Fire Brigade coming out on top in 4-46.257. 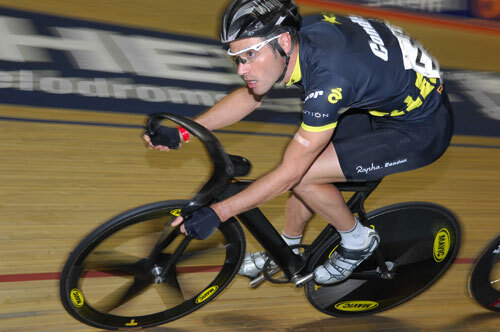 Another special event for Revolution 27 was the DHL Sprint School Keirin Final, where top youngsters who had qualified in the Future Revolution racing during the day were invited to race in the final in front of the capacity Revolution crowd. Luke Boulton didn’t waste the opportunity and powered ahead of Ben Green in the final stages.